As I unwind myself, in an effort to write down about the journey to a quaint aadivaasi village, called Baliapal, in the interiors of North Orissa, I find myself on a bumpy road of mediumship, trying to ferry meanings from one language to another, from one reality to another – a process that denaturalizes and blends them. It is a struggle to communicate this story – of the mixing up of the two cultures; bewildering because I am trying to be a person of the two worlds, trying to be at home in both of them – a difficult task at best. Now-a-days it is fashionable to talk of preserving tribal people, their views, and their ways. But when we talk of preserving another culture, haven’t we already turned it into an endangered species? I would by no means profess this as an effort to preserve, but an effort to bring about some kind of balance between the two worlds – a sort of coexistence. It all began during one of my countless visits to Dilli Haat, the Mecca of all crafts people, who flock here with lots of aspirations. While the whole market place bustled with eager shoppers exchanging notes with even more eager sellers, in a corner, in a dimly lit kiosk, two pairs of blank eyes looked around, as if gazing into nothing. I could hear their silence loud and clear in spite of the pandemonium in the rest of the haat. There was a deep question, a drowning fear and an uncomfortable silence in their gaze. The gaze that hypnotized me. Here I met Aarti and Subal Patra, who hail from Village Baliapal, in the interiors of North Orissa and were trying hard and desperately to help realize their dreams through their NGO, RAHAA. 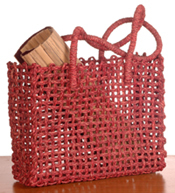 Patras weave bags out of sabaii grass, a traditional craft skill which has become a necessity in North Orissa, and some parts of West Bengal. The next thing I know, I am at Howrah railway station in Kolkata, with my sister, Payal Nath, waiting anxiously to board “Puri Express”. We kick off our five hour long journey, not realizing this would be the beginning of a life long journey. The train rolls up at Basta station’s so-called platform. The halt is actually the slow down of the train for 30 seconds, in which we muster up all our courage to jump off the train along with our belongings, making it in the nick of time. From Basta, Baliapal village is 18 kms, an hour long drive on the bumpy dusty road, in the good old ambassador car of yesteryears. As we try to balance, almost as if sitting on an elephant, with blaring oriya music blowing out of its trumpet, we pass through villages dotted with lotus filled ponds, called pukhris. The entire three dimensional landscape is as if painted in multiple shades and hues of only two colors – blue and green. After an hour long back breaking drive, snaking between thatched huts, the car rolls up in front of a shack, a recently opened telephone booth owned by the proud owner, “Dhruba” – our only connection to the outside world. We get off the car and walk through the dusty path where even the dust smells of fish; and reach Patra’s house which when required converts into the office for RAHAA. It is a three roomed thatched structure with mud floors and mud walls, and on a normal day accommodates eight members of Patra’s family, plus three cats, a dog, two goats and a cow. I imagine myself shrinking in size when I visualize this shack becoming the work place for twenty women with their infants during the days of work ahead. The rest of the evening, Payal and I spend acclimatizing ourselves with the surroundings of the equally decrepit Dak Bungalow that would house us during our stay. Our first day of work, and we are very ceremoniously driven to RAHAA’s office in a thela. Aarti, popularly known as “Bo” by the villagers, which means mother in Oriya, has gathered about thirty women and girls. We need to judge their levels of skills, so we ask Aarti who is the only woman who manages to converse in broken Hindi, and each member is handed sabaii grass to weave a bag. The sample of bag to be copied too is given to Aarti. Aarti very diligently measures the bag and announces in Oriya, “Gutte Haath” – it is an arm’s length!! And lo! Everyone gets down to weaving the bag. By the end of the second day, thirty bags are presented to us amidst gleaming and proud faces. Much to our surprise, all bags are different sizes, varying from 6 inches to 10 inches! The group comprises girls in the age of twelve to women as old as fifty years, and so, the arm lengths are different too. But as far as they are concerned, the bags are the same size – “Gutte Haath”!! First lesson therefore is to introduce them to a standard unit of measurement, and give them tape measures and scales!! The next day we visit two nearby villages, Ujjadda and Shirodia. To welcome us, Patra have organized two chairs in the village. The girls in the village thought us “insane” to be taking such a risk of sitting on the chair, as if sitting on a camel. They fail to understand the logic of not coming down to earth instead of so uncomfortably hanging in the air. The whole night while Payal and I lay on our creaking beds in the Dak Bungalow, talking without any words, hearing without any sounds, we know this is not just one of our many adventure trips. This is the beginning of a journey which would never end. Thus began my tryst with Baliapal. 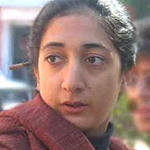 Pooja Ratnaka and her sister Payal Nath run a retail store, Art Bunker, in Hauz Khas Village for the people of many villages, like Baliapal.